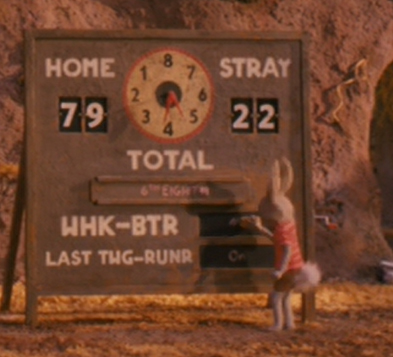 Fantastic Mr. Fox: How to play whackbat in real life | spifftacular. Coach Skip says the whackbatter is supposed to try to hit the cedar stick off the cross rod, but then Kristofferson slides under and leaps over the cedar stick and instead knocks off the twig basket. The twig runners run the flaming pinecone, not a twig, down the field. 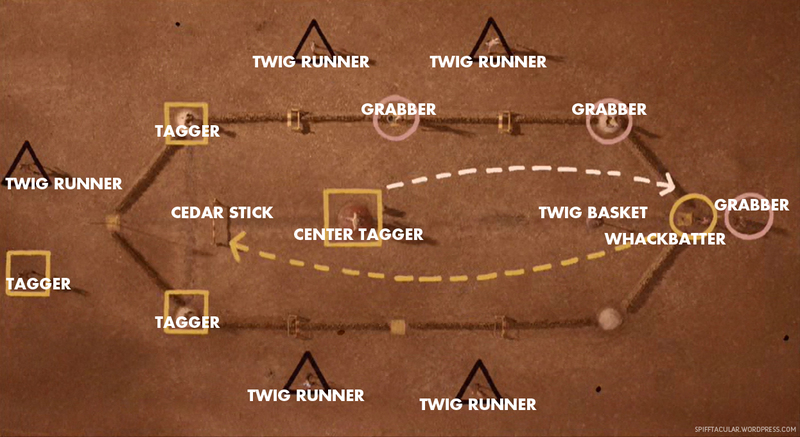 Several of the twig runners simply spin in place for the entire game. Oh yeah, the arrows in the diagram don’t mean anything. 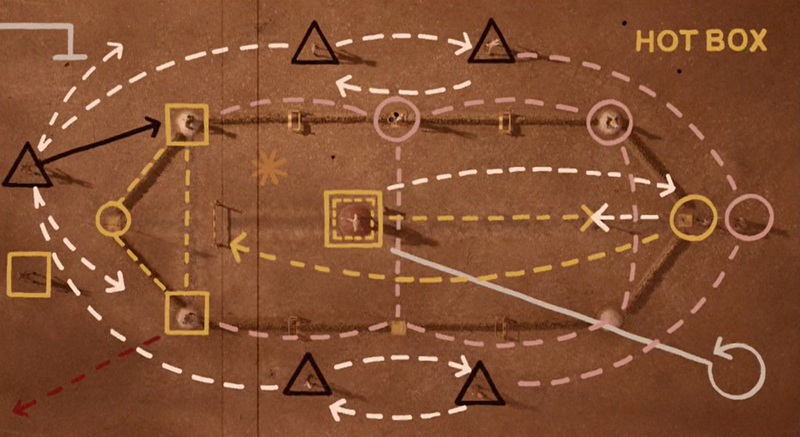 Set the stick and the basket on the ground on opposite ends of the field, and place the center tagger between them, the whackbatter behind the twig basket, and the rest of the players all around, roughly as shown below. There are 13 players on two teams. There is also an umpire. The first team comprises the Center Tagger, three Taggers, and three Grabbers. The second team comprises the Whackbatter and five Twig Runners. Teams switch positions after each round. There are eight rounds in a game. 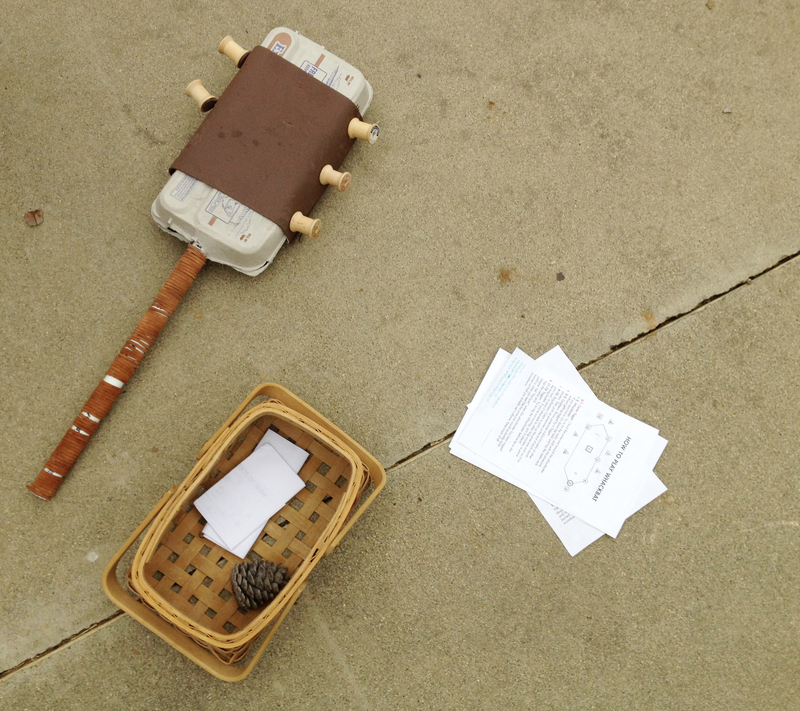 Center Tagger: Chuck the pinecone toward the whackbatter. 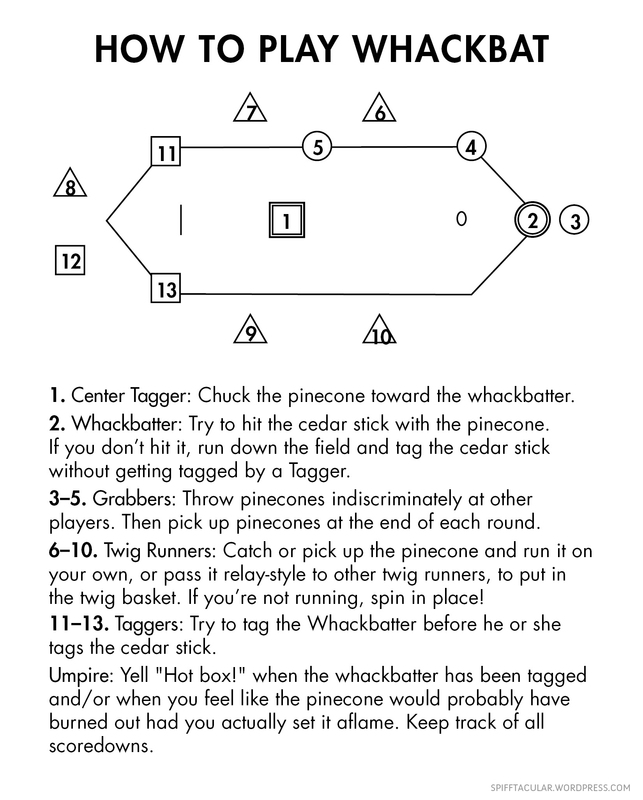 Whackbatter: Try to hit the cedar stick with the pinecone. If you don’t hit it, run down the field and tag the cedar stick without getting tagged by a Tagger. Twig Runners: Catch or pick up the pinecone and run it on your own, or pass it relay-style to other twig runners, to put in the twig basket. If you’re not running the pinecone, spin in place! Taggers: Try to tag the Whackbatter before he or she tags the cedar stick. Grabbers: Throw pinecones indiscriminately at other players. Then pick up pinecones at the end of each round. Umpire: Yell “Hot box!” when the whackbatter has been tagged and/or when you feel like the pinecone would probably have burned out had you actually set it aflame. Keep track of all scoredowns. You can also throw in some arbitrary, Whose-Line-Is-It-Anyway-points-don’t-matter scoredowns, for things like awesome spinning or skilled dashing back and forth. At the end of each round, divide the total scoredowns by nine. Make it easier for your aspiring whackbatting friends and print out these handy instructions. When we played, I didn’t have all the rules and positions as organized as I do here, plus we had some pretty young players, so things were a little more chaotic–but I think that added to the charm and fun of it all. 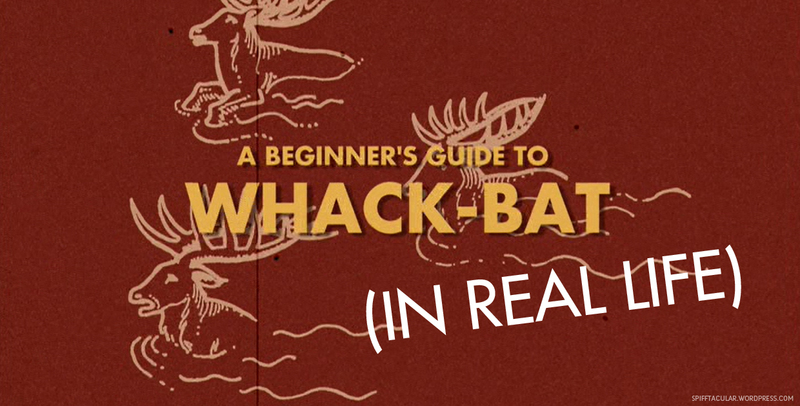 So although I’ve tried to provide some clear, practical instructions here on how to play whackbat, feel free to ignore them and do your own thing. Relish the nonsense! And let me know how your game goes!